PRODUCT DESCRIPTION: Unique trap that functions as a one way valve to catch birds like swallows or woodpeckers that are nesting in hole. When birds create nests that go through a wall, like the side of a home, they only have one way of getting in and out of their nest. This trap can be utilized for such situations. It features a small opening, which is like a funnel, that should be placed over the hole and hung on the outside of the house. Trap placement should be made at night, when the birds are known to be in their nest, so the next morning when they attempt to leave they will be trapped. No bait is needed and several birds can fit in the trap at one time. Easy release can be done because the trap features a flip open door. WHERE TO USE IT: Outside of a structure where nuisance birds are nesting. 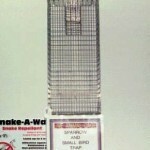 Can also be used when birds are nesting in vents or other holes on a home or building. 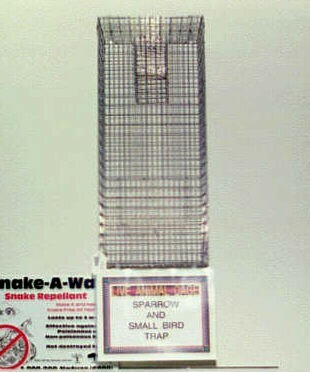 RATE OF APPLICATION: One trap can catch 10 – 20 birds. Comments on BIRD EXCLUDER NH8124 8"X10"X24"
I would like to order a woodpecker trap. I did not see how I could order on your web page. Do you still sell them? BIRD EXCLUDER NH8124 8"X10"X24"